Many listeners like to know about Gospel Time and the people behind the programs they hear. Here we tell you a little about ourselves and Gospel Time Ministries, Inc.. The objective of our our programs is to present the Gospel of Jesus Christ in song. We pray that the Lord will continue to use Gospel Time to reach the unsaved and to encourage the saved! We hope you will enjoy visiting our web site! Our Employees: Gospel Time has no paid employees. Dave Rigg's wife, Pat, serves as the ministry's treasurer. Dave does all the program production and distribution of the programs to radio stations. Dave Rigg is the CEO and President of Gospel Time Ministries, Inc. He produces and hosts the daily Gospel Time programs. In addition, he is the pastor of Gospel Chapel in Bone Gap, Illinois. His hobbies include raising and riding horses, mules, and donkeys and quail hunting. Dave's wife, Pat, serves as the treasurer of the corporation. She is a Registered Nurse and works at a local nursing home. We have three sons and a daughter as well as 6 grandchildren. We try to bring our love for Jesus to you through our programs and this web site. Gospel Time Ministries, Inc. is a non-profit 501c3 corporation. The function of this ministry is to produce gospel music programs for broadcast by radio stations. Dave Rigg began his career in radio broadcasting in 1967. Over the years, he has worked for four different radio stations. He has experience in sports play-by-play, news reporting, programming, and production. Though he now devotes full time to his duties as a church pastor, he remains active in the radio broadcasting industry. His experience in broadcasting Gospel music began in 1973 and continues to this very day! This ministry began in 1988 with our first program broadcast on a radio station in Fairfield, Illinois. When Dave was nominated by the readers of Singing News magazine as one of the Top 10 Small Market Radio Gospel Music Disk Jockeys in America in 1991, other stations became interested in Gospel Time. Over the years, Gospel Time has been carried by numerous stations scattered across the nation. Whenever we have needed new equipment to keep up with the changes in technology, the Lord has always supplied the need! Taking our ministry to the web makes the process even more exciting. Other ministries: Dave Rigg serves as the pastor of Gospel Chapel, a nondenominational church in Bone Gap, Illinois. He has been a pastor since 1991. 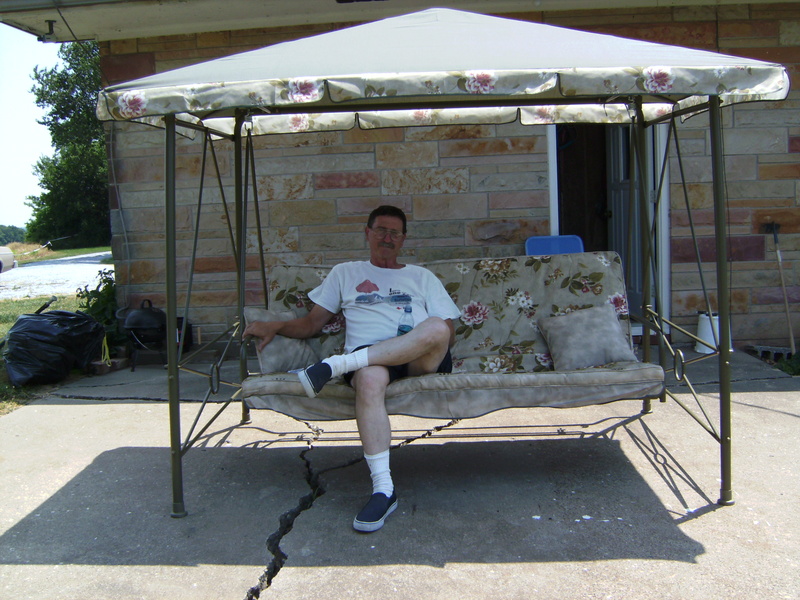 Here is a picture of Dave Rigg relaxing outside our studios.